In our service to the poor, we inevitably have to say goodbye to some extraordinary souls. Some young, some old, some that we’ve helped, and some that we just couldn’t get to in time. We dedicate this page to such individuals. Operation Shanti honors their memory, their perseverance, their human spirit, and their respect for life and humanity in the most challenging of situations. Rachamma, age about 70, passed away on January 15, 2019. Rachamma and her family (daughter, son, six grandchildren) were one of the first families that Operation Shanti met in late 2004. They had been homeless for a long time and Rachamma was a grandmother who spent most of her time taking care of her grandchildren while her daughter and son begged or worked as street vendors. Rachamma also begged and used her money to feed her grandkids, who loved her very much. The grandkids were very close to Rachamma and that stability helped them in their early years on the street. Rachamma was a big supporter of her grandkids living at Karunya Mane and getting an education. We’ll all miss Rachamma very much and hope that other grandparents everywhere can be as responsible and caring as she was to her family, even during the toughest of living conditions. Jayamma, age about 62, passed away on October 7, 2017 from the side effects of chemoradiation treatments. Jayamma was from Mysore and grew up there. A long time ago, her husband passed away, leaving her and her son to fend for themselves. Life was difficult for Jayamma for a long time. She worked as a domestic laborer and had other complicating health issues. Her son has been blind for 20 years. We met Jayamma in August 2017 when one of the doctors we work with told us about her situation--she had just been diagnosed with cancer and needed help getting proper treatment. After numerous trips to the government hospital and neighborhood clinics for three years, without any proper diagnoses or attention to her health issues, her cancer had advanced. Finally, in August 2017, she was able to start treatment at the local cancer hospital; however, her body was unable to handle the side effects and she passed away three months later. Jayamma leaves her son Ashok, who will continue to receive support from us for as long as he needs it. Mahadevi lived on the streets for a long time with her son Ganesh. When we met her in 2006, she and Ganesh were both street vendors. Ganesh was young then, around 10 years old, and he helped the street tea vendor sell his tea. Mahadevi sold fruits on the sidewalk and made a decent living because she was a hard worker and was quite diligent. But she drank a lot, which made life on the street extra difficult. When we opened Karunya Mane and our street kids came to stay with us, we asked Mahadevi if she wanted to put Ganesh in our home. She said she wanted him to go back to another children's home in Mysore, where he had stayed for several years as a little boy until she took him out one day. We asked them to take him back, and they agreed. Ganesh is there today and is studying well in college. Mahadevi sometimes helped us with our other street women, staying with others we had admitted in the hospital (hospitals here require attendants for people who are admitted). She always did a great job -- watched over the patients, forced them to take their medicine or eat even when they didn't want to, and made sure they were bathed. Kaveriamma, age about 55, passed away on December 31, 2012. Kaveriamma was in Project Street since the beginning, in 2005. Kaveriamma came to Mysore when she was in her teens, after she was married to her husband. Then he left her and she found herself alone in Mysore. She knew nobody, had difficulty finding work, and ended up living on the street. She had two children, one girl and one boy. Her daughter and her husband passed away and left their son Rajesh with Kaveriamma. Kaveriamma’s son, Prakash, has two children and stays in Mysore. Kaveriamma also has a great-grandson, Venkatesh, who now lives at Karunya Mane, our children’s home. Kaveriamma was a responsible great-grandmother to Venkatesh, who is a healthy and happy boy even though he spent the first three years of his life on the streets with her. We’ll miss Kaveriamma’s smile and gentle nature, may she finally rest in peace. Rajesh died on September 14 at about 11:30 at night on the streets of Mysore. He was about 20 years old. We met Rajesh in 2005 on the streets, where he lived with his great grandmother Kaveriamma. His mother and father had passed away years earlier, and his grandmother had taken care of him since he was a little boy. Rajesh never attended school and had no interest in an education. He collected used paper and cardboard, an occupation that he and his friends took up to earn money. Unfortunately, he was also seen sniffing shoe polish, which eventually killed him. Rajesh got married at a young age, 16 years, which is quite normal among the poor in India. He had a son, Venkatesh who lives with us at our children’s home, Karunya Mane, and attends an excellent private school in the area. Jayamma died on February 19 at about 4:30 in the afternoon, at Karuya Mane. She was about 70 years old. Jayamma came to stay with us at Karunya Mane after living for years on the street. She once told us that she had run away from home as a teenager, and then lived with her husband on the street. He died many years ago. She has one sister and a couple of children, none of whom made any contact with Jayamma. 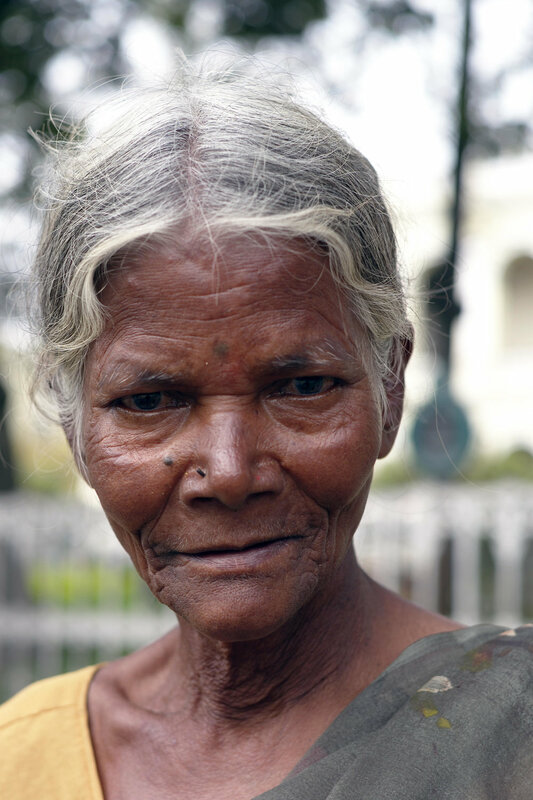 We met Jayamma in 2005 on the streets of Mysore. She begged for a living, was a fiesty and fiercely independent woman, and in 2008 it took us a good week to convince her to get off the street. Towards the end, she developed a heart condition and lost the ability to walk. She remained alert and made frequent contact with her eyes and hand gestures. On January 3 at about 11:00 am, Venkatesh Hegde ("Tata") passed away. He was about 70 years old. Tata had the most beautiful, peaceful eyes. We met Tata in 2006 on the streets of Mysore. When we opened Karunya Mane, we asked him if he wanted to come to stay with us, so that he could get off the street. The only thing he asked was, "Will there be food?" Oh yes, plenty! Tata moved to Karunya Mane in February of 2008. He was originally from a town about a 14-hour bus ride north of Mysore. He had a tough life, losing a son years ago in an accident. We aren't sure how he came to Mysore, but he lived for a long time on the streets of the city, after working as a waiter at a local hotel, and he begged for a living. Tata was a quiet and very polite man, and everybody liked him. Her friends say that Rukkhi was a "good lady" until her husband left her a few years ago -- she then started drinking and neglecting her kids, and her own life and health. It's sad to see beliefs play themselves out in tragic reality -- many women in India believe that if the husband leaves her, she is nothing and life is effectively over. But so many women believe this to be true. Rukkhi earned a living selling vegetables on the streets of Mysore, and used to engage her son's friends to help at a makeshift provision stand, selling items like soap and cigarettes to passers-by for extra income. Nanjunda, Rukkhi's son, lived at our shelter, Karunya Mane. It was difficult to convince Rukkhi to let him go to boarding school, as his daily earnings from selling pens on the street went to her food and drink. Her friends insisted that she let him go to school, and then to come to live at Karunya Mane, so that he could have a better life. She often fought with us, but we do believe that deep down mom knew that being off the street was better for her son. Rukkhi leaves her mom who sat with her daughter every day on the street, selling their vegetables. They rented a house that they shared with their other son, but they did not always go home at night, preferring to sleep on the sidewalk that they had known for their entire lives. We knew Padma for about two and a half years, before she passed away. We're not sure how old she was, but she was likely in her early to mid 30s given the age of her kids. She had two little boys, Harish and Devaraj, and the three of them lived on the streets of Mysore in an alleyway behind a popular drugstore. Padma lost her husband a few years ago and found herself on the street with her two boys. Despite Padma's drinking problem, she cared for her boys. When we met them, Padma cleaned the floors at the drugstore and the boys helped her to earn a few rupees. In 2007, she asked us to send her boys to boarding school, so that they could live away from the street. She was worried that they were being exposed to negative influences on the street, as Harish had started to hang out with other street boys. After a year at boarding school, her boys came to stay with us at Karunya Mane. Padma asked about them often, and visited them when she could. She had gotten another job as a sweeper at a local bank and earned 700 rupees a month (about $16). Padma was a quiet, soft-spoken woman, often kept to herself and had few friends. She had a mom who was also destitute and stayed in the same area of the street that Padma did. Grannie often asked about the boys and always told us to tell them about her. We knew Yashoda for a few years. She spent a few days on the street, earning money begging or cleaning beans, then would go to her house in the village for a couple of days, repeating that cycle. She and her sister Hasina hung out often on the street. They earned about 1 rupee for each kg of beans that they cleaned and took back to the bean seller. Earlier this year, Yashoda got sick and asked us for help. We sent her to the doctor and suggested she get an HIV test. The test turned out positive, and we then went with her to the government HIV clinic to register her there. There, they also did a CD4 test to determine the extent of her condition. After a couple of weeks, the test came back indicating a CD4 count of 303, not low enough to get her started on antiretrovirals based on the government's treatment guidelines. A week later, Yashoda got sick again and we took her to the private HIV clinic, where she could get admitted for a few days. There, they retested her CD4 count, which came back at 44 and not 303. Since the test takes about a week to process, when we got the results, Yashoda had gone home and we didn't know where to find her. She eventually came back to the street a couple of weeks later, her feet swollen and complaining of a fever, fatigue, and general malaise. We admitted her again to the private clinic, where she stayed for about three weeks, and where she was put on antiretrovirals and other medication. After falling ill yet again, we took her once more to be admitted to the hospital. This time, she refused to stay, insisting to be taken home to her village. We took her there, which is where she passed away a week later. She may have known that she was going to die, we don't know, but she talked about wanting to be at home in the end. And, in the end she was where she wanted to be. Yashoda is survived by her daughter and son-in-law, a sister, a brother, and her mother. Zubedabanu was brought to us by a nearby hospital. She had been dumped there by someone in early February 2008. Zubeda had HIV, tuberculosis, a liver condition, and weighed at most 50 pounds when she came to us. The hospital brought her after they stabilized her, as they had nobody to take care of her. She could not walk and was bedridden when we met her. The doctors advised us on the medications she was to take, and a check-up in 30 days at their clinic in the city. Our women at Karunya Mane helped take care of Zubeda -- they took the necessary precautions, and bathed her daily, changed her diapers, and gave her medicine to her. Zubeda was a fighter and desperately wanted to get better. She took her medicine when told and she tried to eat as much as she could. While with us for two months, Zubeda regained some of her strength, was able to walk again and with the help of the women and a walker, took herself on walks every day around the facility, hoping to become strong enough to go back home. She constantly talked about wanting to go back home to find her son, who had run away after mom was taken to the hospital. Zubeda's parents refused to help her or take her in and her husband had abandoned her a while ago. Zubeda's liver condition meant that she could not take the full course of treatment for tuberculosis (two of the four TB drugs are harmful to the liver). In the end, she fell into a coma and we took her back to the hospital, where they did what they could. But, she could no longer fight and Zubeda passed away on April 10, 2008. Although with us for just a short time, Zubeda rallied the women around her, and everyone at KM grew stronger from having known her. We met Jyothi in early 2006; she was a roadside vendor and made flower leis to sell. Jyothi lived in a slum area with her niece and nephew. With her women friends on the street, she would sell these leis and earn decent money during the flower season, which was four months out of the year. Jyothi had a difficult life and a sad ending. As it often happens with many destitute women in India, Jyothi's husband left her a few years ago and she had to fend for herself. Unfortunately, to do this, she put her niece to work. Her niece completed 5th grade but after that, she was not allowed to continue her schooling. Instead, she earned money for Jyothi and her household, which sometimes included Jyothi's brother who couldn't seem to hold onto a job and instead spent a lot of their money on alcohol. When Jyothi got sick this time, she was turned away several times from the government hospital. She weighed about 25 kg (60 lbs) and could barely walk, but even in that condition she was not able to find a doctor willing to help her -- being HIV+, this still happens in India. We took her to a non-profit organization specializing in HIV patients, where she finally got medical attention. She was started on atiretrovirals, as her CD4 count was only 75. Another complication was the hospital's requirement (as all hospitals in India require) that a family member stay with her the entire time she was admitted -- for Jyothi, this was impossible as her brother refused, her niece often disappeared to work to earn money for her dad, and Jyothi had no sister or mother to help out. We cobbled together a solution that included help from our other street women, but the hospital's frustration over the situation didn't help matters. Jyothi's condition never really improved and she took a turn for the worse after a couple of weeks in the hospital, when she started hallucinating, failed to properly take her medicine, and lost her appetite. After being diagnosed six weeks into her hospital stay with tuberculosis, she began treatment but by that time it was too late. Who knows if she would have survived if she had been diagnosed earlier. It was a sad ending for an Indian woman who had lived a very hard life. She simply wanted to make ends meet in a society that has little compassion for women abandoned by their husbands. In the end, we found an excellent terminal care facility for HIV patients in Bangalore (about three hours away) for Jyothi, and although she lasted only a few days there, she was at least comfortable and with caring people when she passed away. The day before, we had visited her and although she was unconscious, she fluttered her eyelids when we talked to her, so we hope that she knew we were there with her to say goodbye. Baby Kesava was born on November 9, 2006 at around 11:30 in the morning. He had a normal birth, weighed 2.3 kg (5 lbs) and both baby and mom were in good health. Kesava was a healthy baby for most of his short life. He fed well and was starting to react to the faces around him, especially his siblings. When Kesava was about four-and-a-half months, he contracted pneumonia and was admitted to the hospital. He and mom stayed in the hospital for about ten days, and although he was given the normal course of antibiotics and got better, he may not have completely overcome the infection. A couple of weeks later, mom took him to the pediatric outpatient clinic, where they prescribed more antibiotics and sent them home. Ten days later, mom took a very sick baby to the hospital and they admitted him, cautioning that baby, as he had septicemia at that point, might not survive. His heart and his brain were damaged and he could not breath on his own. After two days in the hospital, little Kesava died, at five-and-a-half months. Sometimes the poor in India aren't educated about the importance of proper hygiene, especially for babies who don't yet have a fully developed immune system. Yet, when a poor mother like Sushila takes extra care to keep her baby clean and keeps herself healthy so that she can breast feed, tragedies like this are especially difficult to understand. Everyone was very sad the day that Baby Kesava died. Gangadhara: Born in the mid 1990s, died 2007. Survived by his wife, two children, and two step-children. We met Gangadhara's children and wife in May of 2005. Gangadhara had family--a father, two brothers and stepmother--but he preferred staying on the street with his wife and children. Gangadhara contracted tuberculosis some time in 2003, about the same time that his wife and daughter were admitted to the hospital with the same disease. Dad unfortunately refused to be admitted, instead choosing to take just enough of the ATT (antituberculosis treatment) to feel better, so that he could drink again. He was young, so his body could tolerate this deadly cycle. And for four long years, it was a painful cycle for Gangadhara, and extremely difficult in the end as he was fully conscious during his final days. This pattern of taking ATT until one feels better, then hitting the bottle again and refusing to continue the medicine is common among Indian men with tuberculosis, especially the uneducated. TB doctors say that the disease is easily cured by properly taking the medication, and that the women are much better at taking their medicine as instructed than the men. So many fathers die from TB, spreading the disease to those around them in the process, and leave behind a family, like Gangadhara did. Fortunately for his children, their mother is a strong woman and had been supporting them for a few years. We are helping her and her kids, with education and housing. We continue to hope that, with such guidance, they'll be able to avoid the lifestyle and habits that drove their father to an early, avoidable, and very unfortunate death. We met Mani and Asha in May of 2005 on the streets of Mysore. Asha used to attend school but she stopped going after coming to the streets. Mani's husband abandoned them and Mani was forced to earn her living on the street, taking care of her only daughter. Mani's only wish was to get her daughter Asha off the street and into a residential school, as mom knew of the perils of street life for a young girl, having herself been a victim. In October 2005, at Mani's request, we placed Asha in a residential school. But Asha refused to stay at the school and within a couple of weeks she had returned to the street to be with her mom. Asha may have suspected that her mom's health was quite poor, as about a month after returning to the street, mom fell quite ill and lost the use of her legs. Tests showed that Mani was HIV+ and had contracted tuberculosis, a disease rampant among HIV+ patients in developing countries. Although we took Mani to the right physicians, including getting her admitted to the tuberculosis hospital and registering her at the local HIV clinic, the diseases had progressed too far and there was not much that anyone could do. In the early morning hours of June 29, 2006 Mani succumbed to her illnesses. During this entire time, Asha refused to leave her mom even when her uncle tried to force her to go with him to his home. Asha, this incredible 12-year girl old, too mature for her age, bathed and fed her mom, and carried her during the rains when they moved to shelter. Asha knew her mom would soon die, but she still held out hope, often asking "When will my mom get better? Will her legs work again?" We helped Asha start her own flower business, stringing up beautiful jasmine flowers every morning for sale later in the day. From her daily earnings, she bought food for herself and her mom and had some money left over to buy the next day's supply of flowers. We are all blessed to know Asha and to have known Mani, as they only did what we should all do - be good to each other and serve each other in even the most seemingly hopeless of situations. The street women gathered together and gave Mani a proper ceremony and cremation. After the funeral, Asha went to stay with her uncle, and then came to live with us at our children's home. With the help of a generous friend, Asha resumed her educated and graduated from college in 2016. We continue to stay in touch with her and are there to support her in continuing her education. Non-profit. Operating in Mysore India. Our Mission: To directly improve the lives of the exploited, at-risk, and destitute.